I save $703/month using Uber versus owning 2 cars (). I’ve spent $12,041 on 686 Ubers over 6 years. By comparison, car ownership cost $11,783 per year, most of it depreciation. What could $703/month buy you? Well, four years of $703/month and you’ll save enough to climb Mount Everest  unguided. Or you could buy a shiny new laptop every 3 months. More details below. My uberPOOLs average 1.6x longer ⏱ and are 27% cheaper  than UberX, and this bargain is worth it for me much of the time. Because of UberPOOL, my average Uber in 2016 was just $11 per ride. By comparison, I spent $37 per ride on average in 2011 and 2012. It’s as if UberPOOL is paying me $28.50/hour to sit in pools, versus taking UberX. I spent 3.2% of my non-working, non-sleeping hours in 2016 in Ubers, almost 4 days! More details below. Uber pays me $28.50/hour to sit in uberPOOLs, versus taking UberX, the equivalent of two simultaneous minimum wage jobs. More details below. Only 4% of my drivers are women . I got a female driver only once every 25 rides. Living in San Francisco. Mid-career, no kids. Can you save money selling your cars and using Uber? Short answer: Yes! Ditching my cars saves me $703/month. Long answer. Read the below sections. I sold both of my cars in June 2016 in favor of Uber in town and Getaround/Turo for mountain/beach trips (haven’t needed yet because my friends have cars). The joys of Uber and Turo are many (any ride you want when you need it). The toils of car ownership are many (parking, keeping it clean, you have to drive). Vehicle expenses  were $11,783 per year ($8,333 depreciation + $3,450 incidentals). The 2008 BMW M3  was depreciating in resale value $8,333 per year, and the 1996 Jeep Cherokee Classic  was holding its value. I purchased the M3 in 2010 for $80,000 and sold it for $30,000, which is $50,000 of loss over 6 years, or $8,333 per year. Incidentals on the vehicles cost $3,450 per year: $1,000 maintenance, $500 insurance, $1,500 gas (just above the national average of $1,400), $300 car washes (so shiny), $150 registration, and $0 parking. Here’s my Uber data 2011-2016 in Google Sheets format. If you’d like to run your own analysis on it just make a copy or export to Excel/CSV (file > “download as”). You can use my data with or without attribution in any way that you want. 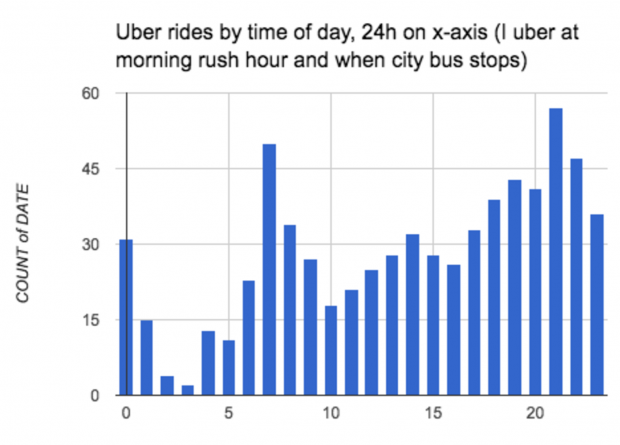 I excluded Lyft and taxis from this analysis, because I almost never use them. Lyft has longer wait times and is more expensive most the time. I like the idea of the competition that Lyft adds to the market but I don’t feel compelled to bolster that with my time and checkbook. I check a couple of times a month to see if Lyft is faster or cheaper. It almost never is, so I use Uber by default. Most of my rides are personal, not expensed. I don’t travel much for work compared to my friends. With the exception of column E, all the spreadsheet data is a direct scrape from my account via rider.uber.com. Column E is human entered (by me). It’s my best guess at gender based on driver first names. I couldn’t get my usual browser-based web scraper to work on rider.uber.com, so I hired Nethaji Reddy from Upwork for $20 to scrape my Uber rider history. As a security precaution I switched my Uber password temporarily to a sharable password. Also as a security precaution I removed my payment methods (VISA, ApplePay, Paypal) from my Uber account except for a stored-value VISA that I had on hand. Uber won’t let you remove all your payment methods so it’s handy to use a low-value stored value VISA. This allowed me to share my Uber account with Nethaji in a way that I considered trusted. 2 hours later I had a CSV file, and began some chugging. A note on privacy . I don’t consider my Uber history private, but many people would for reasons that I find totally reasonable. Since June 16, 2011 I’ve taken 686 Ubers, and spent $12,041. That’s $17.55 per Uber. I really started using Uber in 2014. 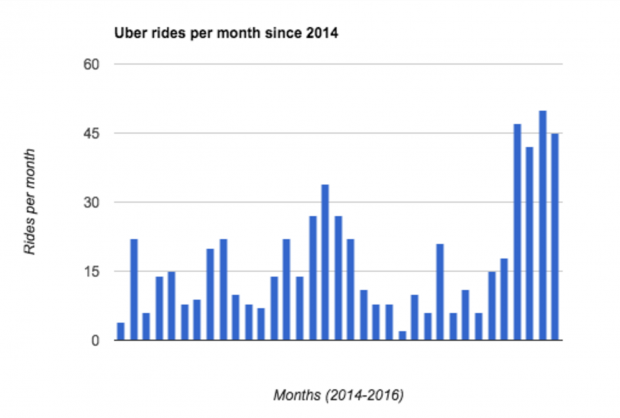 Since then I take on average 204 Ubers per year, and the number of rides I take is growing each year, up 33% from 2015 to 2016. While my ride count is increasing, my spend is falling because of uberPOOL, more on that later. My average cost per ride has dropped every year since 2011. It’s such a big drop that I can now take 3 rides for the price of 1. This is because UberBlack was replaced by UberX which was replaced by uberPOOL. I can’t wait for what’s next. Uber bumper? I travel some with work but not a ton. When I travel for weekend warrior or expeditions it’s mostly more practical to rent a car. Most of my SF rides are personal. Most of my non-SF rides are work. Heat map courtesy of openheatmap.com. In 2011 I took 7 Ubers and spent $262. In 2016 I took 267 Ubers and spent $2,899. An 11x increase in spend. I must really like the service. My rides increased a lot in June 2016, when I sold both my cars. I’m solely reliant on Uber (and buses) to get around town in San Francisco. Since selling my cars in June 2016 my Uber usage has gone up 4x, from 50 rides in the first half of the year to 217 rides in the second half of the year after I sold my cars. 86% of my 2016 spend was after I sold my cars. In June I didn’t Uber because I was sailing across the Pacific Ocean and summiting the tallest mountain in North America. My monthly spend for the 6-month prior to selling my cars was $112/month. After selling my cars it was $390/month. 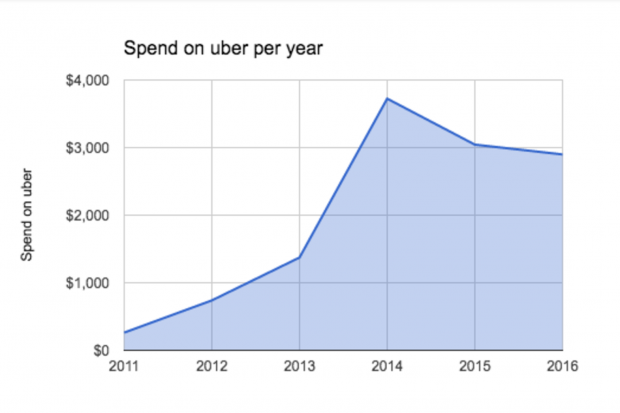 That’s $278/month more spend on Uber. I previously calculated that I used to spend $11,783/year or $981/month on vehicle related expenses on my M3 and Jeep. $981/month – $278/month = $703/month. This means I save $703/month using Uber and Turo/Getaround, vs. owning 2 cars. My annual spend reached a high point in 2014 and has fallen since. 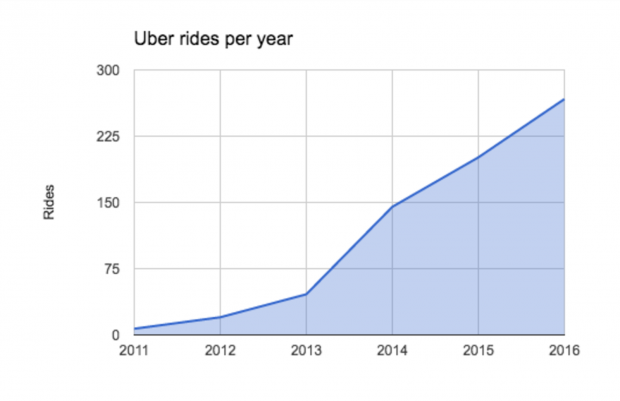 This is because of uberPOOL, a shared ride service with lower prices. If you haven’t tried Uber yet here’s a $10 coupon to use when you register for Uber. I get $10 too, when you take your first ride. UberPool is a shared ride service. It was launched in late 2014. I became a heavy user in 2015. I spend less in exchange for less privacy and a less direct route. In the last two years pools were 69% of my rides, but just 57% of my spend. Since I’m going to take Uber anyway, it’s possible to view any money I save taking uberPOOL as income, since uberPOOL pays me for my time, like a job. How much money do I make using uberPOOL? On average, uberPOOL costs 27% less than UberX, and takes 1.6x longer. This means that a $14 uberX costs just $10 on uberPOOL, but takes 22 minutes instead of 14 minutes. Using uberPOOL, instead of uberX, I’ve saved on 301 rides * ($14.45 average UberX ride – $10.66 average pool ride) = $1140 savings. In exchange, I’ve sat longer in rides. That’s 301 rides * 8 minutes extra minutes per ride on average = 40 more hours in pool rides. $1140 savings over 40 hours is equivalent to Uber paying me $28.50 / hour to ride uberPOOL. That’s twice the the $13 minimum wage in San Francisco. It’s fun to think that sitting in POOLs is like earning the wage of two simultaneous minimum wage jobs at the same time – that’s a lot of burger flipping. Even though I’m spending thousands on uber it’s nice to feel like I’m optimizing my spend. I spent 94 hours in Ubers in 2016. That’s almost 4 days. Since there are 8760 hours per year that means I spent 1.1% of my year in Ubers. Since 33% of my year is spent sleeping, and 33% working. That means I spent 3.2% of my time-off in Ubers. I think it’s so important to be productive in Ubers. I work in Ubers. In fact, I’m writing this paragraph right now in an uberPOOL front seat. I spend 100% of my commute time working and 0% driving or parking. Be pleasant but disciplined. I’ve spent 9 days in Ubers since 2011. I had many wonderful driver and pool conversations, but mostly I work. I take twice as many Ubers between 7:00am and 7:59am (50 rides total since 2011) and 9:00pm and 9:59pm (57 rides since 2011), as normal. Five of my six top hours of Uber usage are in the late evening – an indication of my evening dining tendencies. Expressed in 24h military time, my top Uber usage hours in order are: 21, 7, 22, 19, 20, and 18. Like trips, my spend on Uber throughout the day increases steadily as the day goes on, with a slight slump at 10AM. In general, I spend more on Uber throughout the day. My most common driver name is Joe, the same name as my boyhood best friend. It’s remarkable and wonderful just how diverse my driver set is, in terms of first names. It’s remarkable how few women drivers I have. I got a female driver on average every 25th ride — not very often at all. I’m incredibly happy I sold my cars. The freedom of Uber and $703 savings per month is a wonderful feeling. I’m also happy that I use uberPOOL as much as I do. Even though it takes 1.6x as long, the 27% savings off UberX is dramatic enough for me to use pool in most circumstances. Uber feels like having a super power, and I’m finding myself using it more and more every year, 11x more in fact, since 2011. If you haven’t tried Uber yet here’s a $10 coupon to use when you register for Uber. I get $10 too, when you take your first ride. You might try Getaround/Turo if you need a temporary sports car or SUV for out of town trips.